For teachers: Background information and classroom activities for use with the Opioids Student Booklet. Opiates are powerful drugs derived from the poppy plant that have been used for centuries to relieve pain. They include opium, heroin, morphine, and codeine. Even centuries after their discovery, opiates are still the most effective pain relievers available to physicians for treating pain. Although heroin has no medicinal use, other opiates, such as morphine and codeine, are used in the treatment of pain related to illnesses (for example, cancer) and medical and dental procedures. When used as directed by a physician, opiates are safe and generally do not produce addiction. But opiates also possess very strong reinforcing properties and can quickly trigger addiction when used improperly. UPDATE (January 2017): The Drug Enforcement Administration (DEA) sought public comment on its decision to add kratom to Schedule I. The comment period has closed. The Drugs & Health Blog will provide an update when more information is available. UPDATE (September 2016): On August 31, 2016, the Drug Enforcement Administration (DEA) published in a notice of intent to temporarily place two opioid-like chemicals found in the kratom plant, mitragynine and 7-hydroxymitragynine, in Schedule I. The DEA received numerous comments from researchers, members of the public, and congress expressing concerns about this action. In response the DEA has withdrawn its notice of intent and is soliciting public comments on this issue. Instructions for providing comments can be found here. Kratom is a tropical tree found in Southeast Asia, with leaves that contain some of the same chemicals found in opioids. Some people—especially in areas of the world where kratom trees are common—use it as a stimulant. Kratom isn’t currently an illegal substance, and has been easy to order on the Internet in recent years. In spite of its easy availability, however, we’re still learning about kratom’s effects on a person’s brain and body. Here are some things we know about kratom—and just as important, what isn’t known yet. People have used kratom leaves as a stimulant, for pain relief, or to improve mood. The leaves have a bitter taste, and are sometimes made into powder for tea, chewed or smoked, or eaten in food. Kratom may also be sold as a leaf, powder (sometimes in packets labeled “not for human consumption”), or extract, with names like Herbal Speedball, Biak-biak, Ketum, Kahuam, Itrhang, or Thom. If you consume kratom, you could have some uncomfortable and possibly dangerous side effects: nausea, itching, sweating, increased sensitivity to sunburn, loss of appetite, and, for some users, psychotic symptoms (bizarre behavior, strange beliefs, hearing voices, etc.). Kratom users might also experience long-lasting health effects: difficulty sleeping (insomnia), frequent urination, darkening of the skin, dry mouth, and anorexia (an intense fear of gaining weight, which can lead a person to dramatically reduce the amount of food they eat and resist maintaining a healthy weight). It isn’t clear yet whether kratom is addictive, but users can become dependent on it: Their bodies will have side effects if they try to stop using it. Some users have reported becoming addicted to kratom, which means they go to great lengths to keep using it, even when there are negative consequences for their relationships, jobs, or health. Plus, a study in Thailand has found that people who use kratom over a period of several years have a much higher risk of using other substances—especially heroin, MDMA, and meth. If kratom is addictive, we don’t know yet which kinds of treatment could help with the addiction. It’s impossible to know what other ingredients may be mixed in with kratom that’s sold commercially. For this reason, the Food and Drug Administration (FDA) has warned people not to use any products labeled as containing kratom. Consider the potential risks before you decide to use any drug. As with synthetic marijuana and other unregulated drugs, what we don’t know about kratom could end up being the most important information of all. Opiates elicit their powerful effects by activating opiate receptors that are widely distributed throughout the brain and body. Once an opiate reaches the brain, it quickly activates the opiate receptors that are found in many brain regions and produces an effect that correlates with the area of the brain involved. Two important effects produced by opiates, such as morphine, are pleasure (or reward) and pain relief. The brain itself also produces substances known as endorphins that activate the opiate receptors. Research indicates that endorphins are involved in many things, including respiration, nausea, vomiting, pain modulation, and hormonal regulation. When opiates are prescribed by a physician for the treatment of pain and are taken in the prescribed dosage, they are safe and there is little chance of addiction. However, when opiates are abused and/or taken in excessive doses, addiction can result. Findings from animal research indicate that, like cocaine and other abused drugs, opiates can also activate the brain's reward system. When a person injects, sniffs, or orally ingests heroin (or morphine), the drug travels quickly to the brain through the bloodstream. Once in the brain, the heroin is rapidly converted to morphine, which then activates opiate receptors located throughout the brain, including within the reward system. (Note: Because of its chemical structure, heroin penetrates the brain more quickly than other opiates, which is probably why many addicts prefer heroin.) Within the reward system, the morphine activates opiate receptors in the VTA, nucleus accumbens, and cerebral cortex (refer to the Introduction for information on the reward system). Research suggests that stimulation of opiate receptors by morphine results in feelings of reward and activates the pleasure circuit by causing greater amounts of dopamine to be released within the nucleus accumbens. This causes an intense euphoria, or rush, that lasts only briefly and is followed by a few hours of a relaxed, contented state. This excessive release of dopamine and stimulation of the reward system can lead to addiction. Opiates also act directly on the respiratory center in the brainstem, where they cause a slowdown in activity. This results in a decrease in breathing rate. Excessive amounts of an opiate, like heroin, can cause the respiratory centers to shut down breathing altogether. When someone overdoses on heroin, it is the action of heroin in the brainstem respiratory centers that can cause the person to stop breathing and die. As mentioned earlier, the brain itself produces endorphins that have an important role in the relief or modulation of pain. Sometimes, though, particularly when pain is severe, the brain does not produce enough endorphins to provide pain relief. Fortunately, opiates, such as morphine are very powerful pain relieving medications. When used properly under the care of a physician, opiates can relieve severe pain without causing addiction. Feelings of pain are produced when specialized nerves are activated by trauma to some part of the body, either through injury or illness. These specialized nerves, which are located throughout the body, carry the pain message to the spinal cord. After reaching the spinal cord, the message is relayed to other neurons, some of which carry it to the brain. Opiates help to relieve pain by acting in both the spinal cord and brain. At the level of the spinal cord, opiates interfere with the transmission of the pain messages between neurons and therefore prevent them from reaching the brain. This blockade of pain messages protects a person from experiencing too much pain. This is known as analgesia. Opiates also act in the brain to help relieve pain, but the way in which they accomplish this is different than in the spinal cord. There are several areas in the brain that are involved in interpreting pain messages and in subjective responses to pain. These brain regions are what allow a person to know he or she is experiencing pain and that it is unpleasant. Opiates also act in these brain regions, but they don't block the pain messages themselves. Rather, they change the subjective experience of the pain. This is why a person receiving morphine for pain may say that they still feel the pain but that it doesn't bother them anymore. Although endorphins are not always adequate to relieve pain, they are very important for survival. If an animal or person is injured and needs to escape a harmful situation, it would be difficult to do so while experiencing severe pain. However, endorphins that are released immediately following an injury can provide enough pain relief to allow escape from a harmful situation. Later, when it is safe, the endorphin levels decrease and intense pain may be felt. This also is important for survival. If the endorphins continued to blunt the pain, it would be easy to ignore an injury and then not seek medical care. There are several types of opiate receptors, including the delta, mu, and kappa receptors. Each of these three receptors is involved in controlling different brain functions. For example, opiates and endorphins are able to block pain signals by binding to the mu receptor site. The powerful technology of cloning has enabled scientists to copy the genes that make each of these receptors. This in turn is allowing researchers to conduct laboratory studies to better understand how opiates act in the brain and, more specifically, how opiates interact with each opiate receptor to produce their effects. This information may eventually lead to more effective treatments for pain and opiate addiction. The following activities, when used along with the magazine on opiates, will help explain to students how these substances change the brain and the body. The student will learn the way in which opiates alter the function of nerve cells. Remind students that long-term abuse of opiates, such as heroin, changes the way nerve cells in the brain work. These cells become so used to having the heroin present that they need it to work normally. This, in turn, leads to addiction. If opiates are taken away from dependent nerve cells, these cells become overactive. Eventually, they will work normally again, but in the meantime, they create a range of symptoms known as withdrawal. Have students create visual representations of normal nerve cells, dependent nerve cells, overactive nerve cells, and an opiate. Then have the students use these representations to develop, in comic art format, the process by which opiates change the normal functioning of neurons. The student will learn how opiates produce an analgesic effect. Note that opiates are powerful painkillers and are used medically for treatment of pain. When used properly for medical purposes, opiates do not produce an intense feeling of pleasure, and patients have little chance of becoming addicted. Have students search the Internet and other sources for information about pain, pain control, and the way opiates produce their analgesic effect and then prepare a brief summary report. In general, opioids are psychoactive chemicals that work by binding to opioid receptors in the body. These receptors are found principally in the central and peripheral nervous system as well as the gastrointestinal tract and can produce both the good and bad effects of opioid use. Many teens don’t know that there are illegal opioids (like heroin) as well as legal opioids that are prescribed for pain relief (like hydrocodone, which has the brand name of Vicodin). This is why common painkillers like Vicodin are so often abused—because they provide a “high” while relieving pain. Natural opiates are alkaloids, nitrogen-containing base chemical compounds that occur in plants such as in the resin of the opium poppy. Natural opiates include morphine, codeine, and thebaine. Semi-synthetic opioids are opioids created in labs from natural opiates. Semi-synthetic opioids include hydromorphone, hydrocodone, and oxycodone (the prescription drug OxyContin), as well as heroin, which is made from morphine. Fully synthetic opioids are opioids that are completely manmade, including fentanyl, pethidine, levorphanol, methadone, tramadol, and dextropropoxyphene. Some opioids (e.g., morphine, codeine, OxyContin) are used by doctors to treat various things, such as pain after surgery. But opioids also have addictive properties and negative health effects that make them dangerous when abused. Do you have other questions about types of drugs? Tell us in comments. Learn more about the different types of opioids in this updated post from 2013. Semi-synthetic/manmade opioids are created in labs from natural opiates. Semi-synthetic opioids include hydromorphone, hydrocodone, and oxycodone (the prescription drug OxyContin), as well as heroin, which is made from morphine. Fully synthetic/manmade opioids are completely manmade, including fentanyl, pethidine, levorphanol, methadone, tramadol, and dextropropoxyphene. Prescription opioids (e.g., morphine, codeine, OxyContin) are prescribed by doctors to treat pain and provide millions of people with much needed relief when used as prescribed. However, opioids can produce a “high,” so some people abuse them. This has led to thousands of overdose deaths. In 2008, prescription opioids were responsible for 14,800 overdose deaths and in 2009, for more than 475,000 emergency room visits. Update: What does it mean to “misuse” opioids? Find out here. Like what you see? Follow us on Twitter (@NIDAnews) and Facebook (@NIDANIH), or search #NIDATeens for updates. All materials appearing in the Research Report Series are in the public domain and may be reproduced without permission from NIDA. Citation of the source is appreciated. Dextromethorphan (DXM), a cough suppressant and expectorant found in many OTC cold medicines. It may produce euphoria and dissociative effects or even hallucinations when taken in quantities greater than the recommended therapeutic dose. Promethazine-codeine cough syrup, a medication that contains codeine, an opioid that acts as a cough suppressant and can also produce relaxation and euphoria when consumed at a higher-than-prescribed dose. It also contains promethazine HCl, an antihistamine that additionally acts as a sedative. Although only available by prescription, promethazine-codeine cough syrup is sometimes diverted for abuse. 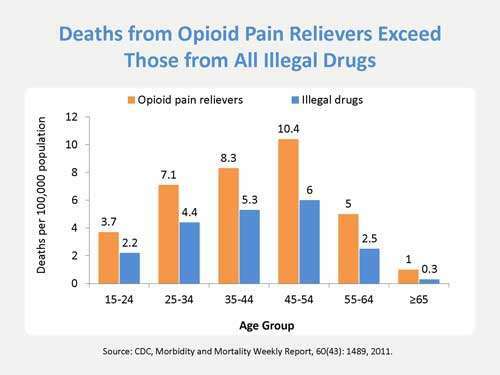 More people die from overdoses of prescription opioids than from all other drugs combined, including heroin and cocaine (see "The Prescription Opioid Abuse Epidemic" below). Over 2 million people in the United States suffer from substance use disorders related to prescription opioid pain relievers. The terrible consequences of this epidemic include overdose deaths, which have more than quadrupled in the past decade and a half. The causes are complex, but they include overprescription of pain medications. In 2013, 207 million prescriptions were written for prescription opioid pain medications. Prescription opioid pain medications such as Oxycontin and Vicodin can have effects similar to heroin when taken in doses or in ways other than prescribed, and research now suggests that abuse of these drugs may actually open the door to heroin abuse.